Here is a Children's Book Review, by Sue Stirling. Since finishing her teaching degree, Sue Stirling has worked in many schools in the Perth metropolitan area. She recently started a blog on her teaching activity ideas. Sue loves children's literature, play-based learning, and writing children's book reviews for The Book Chook. 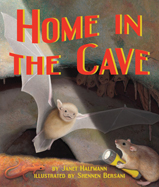 Home in the Cave, written by Janet Halfmann, illustrated by Shennen Bersani and published by Sylvan Dell Publishing (2011), immediately drew me into a secret place, a world that none of us, unless we are the adventurous type, get to see. The illustrations and story come together beautifully; they truly are a match made in heaven! Baby Bat is nervous. His mom is leaving the cave to find food and she has asked him to practise his flying skills while she’s away so that one day he can join her on her journeys. He never wants to leave the safe warm place he calls home - he just wants his life to stay the same. Baby Bat listens as the other bats share their mother’s wonderful escapades, their stories taking on more and more marvellous feats of bravery! As he listens, he becomes even more convinced that the world outside is a far too dangerous place, and he is better off staying in the comfort and security of his home. On meeting a new friend, a packrat who has named himself Pluribus, (taken from the name on the shiny coins he has found), Baby Bat discovers that he plays an important role in the life cycle. He can’t quite believe that his droppings (more accurately described in the book as his guano) provide sustenance to many creatures in the cave. I am sure children of all ages will love to hear this as they do have an intense interest in bodily functions! When Baby Bat returns to his cave, he finds himself thinking of the way he contributes to life in the cave. He starts to find the courage he needs to learn to fly. As he ponders his new found information his wings start beating with excitement. I loved the descriptive language in the book, such as thousands of other moms looking like a furry blanket and stalagmites poking up from the floor like sandcastles. An added wonderful bonus to this story can be found on pages 30-33. Teachers and parents alike will be delighted to find the information in these pages. Topics such as life in cave zones, rock formation and cave habitats can be found in these sections. As a teacher, I have found children love hearing and learning about creatures and their habitats, and they love to learn new words and show others their new-found skills. The interactive games and activities invite children to participate and develop their understandings in a rich context. The author has done all the hard work to those inevitable curly questions children ask! I believe this book will appeal to many age groups, from Kindergarten onwards. It’s rich with descriptive language, factual information and a marvellous story line that invites children to spread their wings and challenge their thinking. Home in the Cave is a clever blend of fiction and nonfiction and has the potential to speak to children in a number of ways. Children who love factual information will be delighted with the correct terms relating to bats and cave life, children who love to imagine will enjoy the adventure and the wonderful illustrations and children who are a little nervous and scared of change and growing up, I believe, will find comfort and strength to tackle new things! Thanks so much for your wonderful review of my book, Home in the Cave. I loved how you explained how the book can take kids in so many directions. Happy Reading to All! @Janet Halfmann http://www.janethalfmann.comI love Sue's immense enthusiasm for children's literature, Janet. You and indeed Sylvan Dell generally, produce great books.